Mayor Rahm Emanuel met with students Friday morning, just after they returned from their trip to the White House. A bus full of students and staff from Harper High School returned to Chicago Friday morning from a visit to the White House. They were invited by First Lady Michelle Obama and got to meet the President as well. The First Lady took an interest in the students after This American Life aired episodes about how the school has been dealing with gun violence in the Englewood neighborhood. Mrs. Obama met with them in Chicago in April, then invited the students to her house. 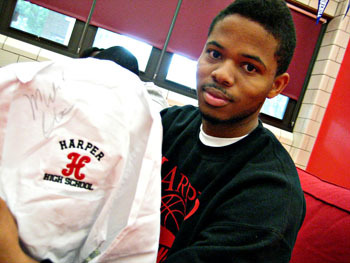 Thomas, who’s seen multiple friends and family members shot and killed, including Harper student Shakaki Asphy, who was gunned down a year ago this month. Ten Harper High staff members were also along on the 15-hour coach bus ride to D.C.
Mayor Rahm Emanuel stopped by the South Side school Friday morning, joining in on the national attention being paid to Harper kids. Meeting the president was the highlight of the trip, one boy told Emanuel. “As soon as he said, ‘Hey, Harper!’ my whole body just got weak!” he recounted. The students said they were given a “deluxe tour,” introduced to everybody, from secret service agents to the White House chef. In addition to meeting with the president for 45 minutes privately, they got a shout out from him at an event with the Baltimore Ravens football team. Harper Principal Leonetta Sanders says she appreciates that the First Lady has turned more of her attention to the issue of urban gun violence in recent months, and has made an effort to get to know Harper students. “She wanted to really just have a deep conversation with them, one-on-one, and just really hear their stories. But also, at the same time, to encourage students to keep going,” Sanders said. Junior Sandelio Wright, who’s been shot at on his walk to school, said he was moved by the whole trip, especially a night visit to the Lincoln Memorial. The Harper students also visited Howard University, where they met a student from their neighborhood who’s now a Rhodes scholar working on her PhD. The trip was paid for through donations collected by Chuck Smith, a Chicago attorney at the Skadden law firm. Smith had heard This American Life’s reporting on Harper and was asked by Mayor Emanuel to raise money for the trip. Principal Sanders, who has an unshakably positive outlook, hopes things like this trip--and the attention to her school--might slowly change the violence that has sent her to funeral after funeral for slain teenagers. Sanders’ broader hope is that by changing students, they can change the neighborhood where those students are growing up.